A vintage mood swings across our Ana collection, with a retro design, oversized button detail and si.. Lined lace dress with a flattering high waist, eyelash trims, button keyhole fastening and zip faste..
Fabulous Cece Tweed-Style A-Line Short Skirt Fully Lined Two faux pockets at the front ..
Claris party dress with mesh top and fitted waistband. 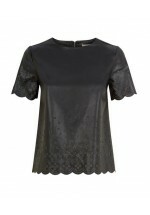 Shell: 100% Polyester Lining: 100% Poly..
From Darling Clothes, a streamline yet feminine-style tunic with a round neckline, lined chiffon, ac..
With laser-cut detail and leather look material, the Georgia Tunic Dress is rather edgy! 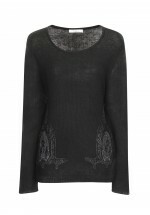 Complete wi..
A stylish knit is an essential seasonal piece and therefore our Johanna jumper is an absolute must-h.. This relaxed-fit Larissa kimono from Darling with its multi-shaded blue haze colouring is semi-sheer..